I'm not typically in the habit of using the Strong Female Character Friday column to review new movies, but in this rare case, it makes a lot of sense. 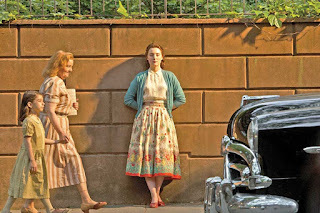 Brooklyn is a gorgeous, sweet, lovely film that is at its core the story of one amazing woman. She is in every possible understanding of the word a strong female character, and it honestly makes the most sense to talk about this movie by talking about her. In talking about her, by which I mean Eilis Lacey (Saoirse Ronan) in Brooklyn, I'm going to have to talk through the plot of the film. But I'm not putting up a spoiler alert (though you can take this as one if you need it) simply because this isn't the type of film where spoilers matter. A close watching of the trailer will actually tell you everything that happens in the film and the ending isn't so much a shock as a satisfaction. Brooklyn really isn't about the destination, it's all in how you get there. So, to begin. 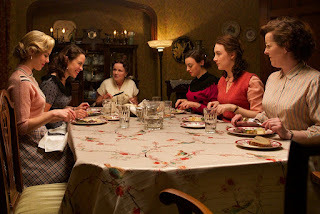 Brooklyn is based on the novel of the same name by Colm Tóibín, which I have not read. From what I understand, the movie actually improves on the book by cutting out a lot of the more unnecessary bits, so let's just assume it's not important. 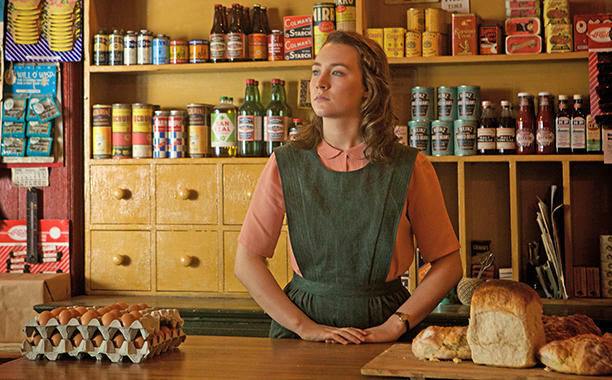 The film is a two-hour little indie flick starring Saoirse Ronan as a young woman who emigrates from Ireland and lands in Brooklyn, New York. Then, when she hears about a family tragedy, she goes back to Ireland and must choose where she will live the rest of her life. That's the plot in a nutshell. There really isn't anything more to the actual story. This is a film about one woman deciding if she wants the life she's built for herself in a strange land or a life filled with everything she's ever known in her ancestral home. The beauty in the film comes in how they present these choices and in how we are led into Eilis' inner life so that we genuinely care about her decision. Eilis Lacey (pronounced AY-lish) lives with her mother and sister in a small town in Ireland and her life is going nowhere fast. We meet her on her last day at her old job, a once-a-week part-time gig working at a shop on Sundays. She's quitting because her sister Rose (Fiona Glascott) has arranged for Eilis to go to America. Rose set it up through the Church, networking their priest in town with a priest in Brooklyn to find Eilis a job that will sponsor her green card and even a place to stay. Eilis is devastated to leave her sister - not so much her mother - but understands that there is really nothing for her in Ireland. There's no work, no marriage prospects, nothing for Eilis to build a life on. So she goes to America. Her passage over is rough (think food poisoning mixed with seasickness), but with the help of a world-wise Irish girl who's already been to America, Eilis learns how to get through. And then she's there, in Brooklyn, in her new home. Like I said above, this movie isn't really about the plot so much as it's about Eilis. We're not super invested in the actual events of her life, but rather in how they make her feel. Eilis is immediately immersed in a world that is wholly unfamiliar to her. She lives in a boarding house with a bunch of other Irish girls and a landlady who presides over dinner every night like a matron at school (Julie Walters, clearly having too much fun). Her job is as a clerk at a fancy department store where she struggles to make small talk with the glamorous patrons and her boss (Jessica Paré) struggles to get Eilis up to the task. For a long time she doesn't even seem to have any friends. She is simply lost and cripplingly lonely. Things turn up when Eilis finally breaks and asks for help. The priest who brought her over, Father Flood (Jim Broadbent), is sad to realize that Eilis has been hiding her sadness but immediately comes to the rescue in a really sweet way. He uses the church money to set her up with night classes in bookkeeping, and slowly things start to come around. The classes help Eilis feel like she's got a goal and something to do, while also boosting her self-confidence. And, conveniently, just as she's settling in Eilis finds something else to distract her. Something distinctly boy-shaped: the adorable Tony Fiorello (Emory Cohen). Tony and Eilis meet at a dance and hit it off pretty quickly, though in a nice twist there's none of that immediate intimacy that many films pretend happens when you meet someone for the first time. Eilis is shy and reserved and Tony is afraid of scaring her off, so he holds back a lot. Their first few dates are sweetly wonderful in how stinking awkward they both are. As she grows more comfortable with Tony, however, Eilis comes out of her shell with him and this gives her the confidence she needs to come out of her shell with everyone. This is the part of the story where we see Eilis come into her own, and it's interesting to me that it's shown to be related to but not directly caused by her relationship with Tony. Certainly he's a big part of her life, but I think it's more than that. It's like everything in Eilis' new life starts clicking at the same time. She's doing well in her classes so she's more confident. She's more confident so she does better at work. She feels good about herself so she is willing to be vulnerable enough to pursue a relationship with Tony. And having a relationship with Tony helps her bond with the girls in her boardinghouse because she needs their advice. Everything works together in this, because that's how it actually works in life. Your life isn't separated into neat little categories of "work" and "friends" and "romance" and "future", it's all mushed together and a change in one area affects it all. So I like that the movie shows Eilis' life as one holistic piece. Anyway, things with Tony get pretty serious pretty quickly, and it's like we can see Eilis leveling up before our very eyes: she stands taller, makes decisions more easily, speaks her mind. She survives meeting Tony's big, ostentatious Italian family (she gets lessons in how to eat spaghetti just for the occasion), and they even start talking pretty seriously about marriage. It's all going awesome for Eilis. She has the life that Rose sent her to America to find. And then disaster strikes. Rose dies suddenly, presumably from an illness she'd been hiding for some time. Eilis is devastated by the news, even more so when she finds that there is no way for her to return to Ireland in time for the funeral. They bury Rose without her and she's heartbroken. After a phone call to her mother, who now has no family left in the world except Eilis half a world away, Eilis decides that she needs to go home. Just for a bit, to help her mother adjust and to say her goodbyes to Rose. It's interesting how in a lot of other movies, this is where Tony would be a not-so-good boyfriend, pressuring Eilis not to go or being a jerk about this in some way. But that's not what happens. Instead, Tony completely understands that she needs to do this. He also, however, is terrified that she won't come back. He doesn't ask her to stay, but he does ask her to marry him. Not in a big ceremony or anything, just a little courthouse proceeding. What Tony wants is to know for sure that Eilis will come back. And, ultimately, nothing can really give him that assurance. But they're planning on getting married anyway, so Eilis agrees. Also there's a super cute scene where Tony takes Eilis out to Long Island and shows her a parcel of land his family has bought. Long Island is about to go into a building boom, and Tony and his brothers are setting up a construction company to take advantage. They're building a house for Tony and Eilis, if Eilis wants it. So Eilis marries Tony in a quickie ceremony and only days later is on a boat back to Ireland. She arrives at home and decides not to tell her mother. Unfortunately, this creates complications. While Eilis understandably doesn't want to tell her mother that she eloped with an Italian man in New York, she also doesn't want her mother to sink her claws in and try to get Eilis to stay forever. But that's exactly what happens. The thing is, the Eilis who comes back is not the same person as the Eilis who left. As a result, Eilis finds that life in her small town is a lot more bearable than it used to be. She has a spine now, a voice and opinions she's not afraid to share. It's only days before she's caught the eye of local catch Jim Farrell (Domnhall Gleeson)*, and only a week before the people at her sister's old job come in asking her to come do a few days work sorting out the books. In other words, Eilis quickly finds that life in Ireland isn't nearly as dire as it was just a year ago. Her circumstances are quite the opposite. In a telling moment, she admits to Jim that "I wish it'd been like this before I left." Eilis has come home a completely different person, and now she finds that she could actually have a life in Ireland after all. A good one. That's where the time we've spent invested in Eilis' emotions really pays off. Because now Eilis has to make a choice and we care a whole hell of a lot what her decision is. Yes, she's already married to Tony back in Brooklyn, but it's not like marriage records were commonly communicated across country lines. No one would have to know. Eilis could stay and marry Jim Farrell and live a quiet life in the town she's from. She could have a good life in Ireland. Or she could go back to America, to Tony and Brooklyn and the endless opportunity with no assurance of success. I guess this is the crux of why I like the movie so much (and I do really like it a whole heck of a lot): Eilis is faced with a decision, but there's no real wrong answer. I personally was plugging for her to choose Tony and Brooklyn, but I would have understood if she didn't. Tony and Jim are very different men, but they both love Eilis a lot. Neither of them is set up as an obvious bad choice. And instead of giving us the easy answers of what Eilis should do, the movie just lets us sit in this question for a long time. I love that because it refuses to make this an easy choice. If it were an easy choice, Eilis wouldn't be such a fascinating character. This story would be insipid and annoying. But it's hard because choosing one thing means losing out on the other, and the story doesn't gloss over that. In the end, Eilis choice defines the woman she has become. She chooses (spoilers?) to go back to Tony and to live in America. There's a beautiful moment when she finally claims that part of her identity by standing up to her old boss, a horrible woman who loved making Eilis miserable. Instead of letting the woman get to her, Eilis simply stands and responds to the woman by saying, "My name is Eilis Fiorello." The implication here is that Eilis not ashamed of her choice. She makes it and she sticks to it and she doesn't regret it. Not to say it doesn't make her sad - Eilis has a heart-breaking scene with her mother where she explains she's married and going back to America and her mother basically disowns her - but that it's not the end of her world. She knows she made the right choice. The best part of the film is really the ending, though, where we see Eilis once more on a ship headed to America. This time, she's the world-wise Irish girl giving counsel to the young emigree coming to Brooklyn. As she tells this girl what to do, we see how much Eilis has grown and changed in the past year. Look, a strong character is all well and good, but what I really love is a character who grows into her strength. Eilis at the beginning of the story is lightyears behind where Eilis winds up. She's a mousy, timid, terrified girl with no idea of her place in the world and not much ambition to make one of her own. The Eilis at the end is older and wiser and sadder, but also more confident and ready to embrace the life she's chosen. Brooklyn is a really good movie. It works because the film centers itself on Eilis emotional development, and it doesn't hurt that Saoirse Ronan is a shockingly good actress. The little emotions playing across her face give us more insight into who Eilis is than a world of voiceover narration could manage. The directing is on point, the cinematography is stunning, and the screenplay is solidly good. All of these things, though, are just working together to tell the story of how one woman found herself by embracing an unknown future. This movie works because it's at once a universal story and a personal one. On the one hand, emigration is such a common experience and so foundational to our country that most of us have some kind of relative with a story like Eilis'. On the other hand, this movie isn't about emigration in general, it's about Eilis and Eilis' emigration. That makes a difference. This is just one woman's story and it's more powerful for how clearly it knows its limitations. But mostly I love this movie because I fell in love with Eilis herself. She's so strong but so soft at the same time. She cries. She misses home desperately. She's shy. She's angry. She's cautious but not afraid to admit her feelings once she's sure of them. Eilis is a good woman, but she's also a strong one in a way we don't often count strength. Strength is measured in muscles and fighting skills, sure, but it's also in the decision to leave your entire world behind for an uncertain future. Eilis is so strong, even though she never really feels it. I think of her making that journey, of the journey like it that my grandmother made when she was just a teenager, and I sincerely wonder if I would have been able to do the same. But I like to think I'd be willing to try. The costumes are also amazing. Just saying. *It gave me a teensy bit of joy that this film had both Mrs. Weasley (Julie Walters) and Bill Weasley (Domnhall Gleeson) in it. My favorites movies were from the 20th Century until 2015. 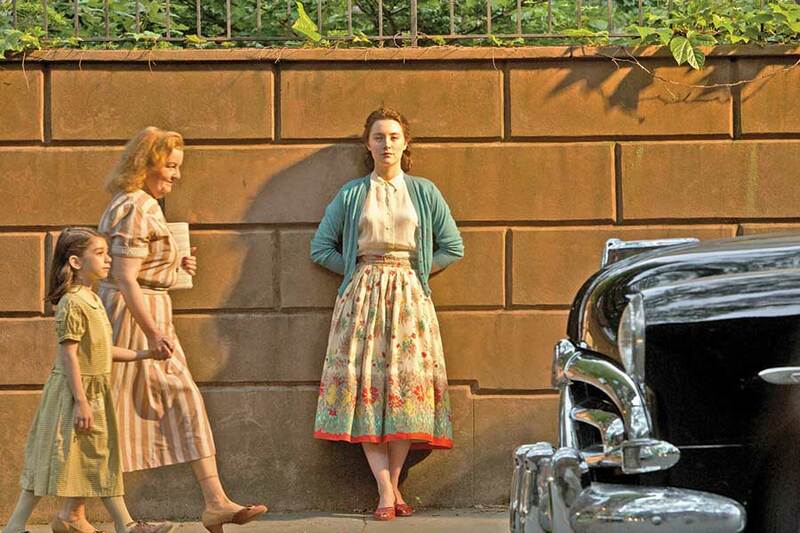 Raging Bull and Rain Man was replaced by "Carol" and "Brooklyn." After reading the book and watching the movie "Carol" (The Price of Salt), I thought I would never find anything to match, I went desperately searching and found "Brooklyn." 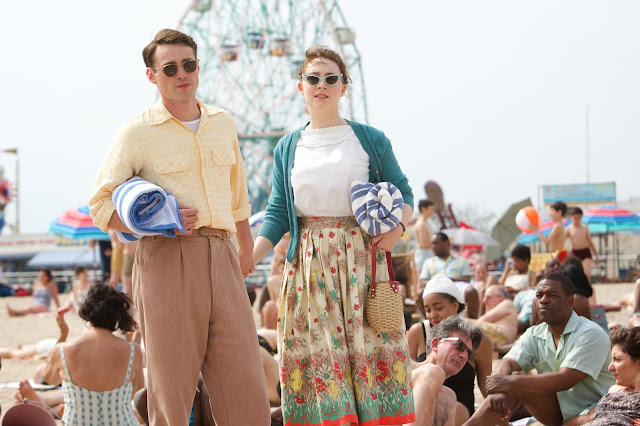 Brooklyn is now my all time favorite movie followed closely by "Carol." Finding two movies of this caliber in the same year, it seemed the world would end. 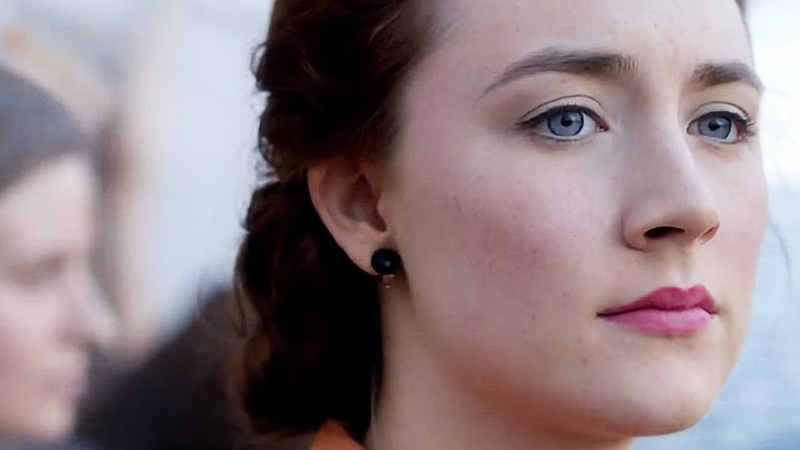 Watch Brooklyn and note that Saoirse Ronan is in almost every seen and she hits every single scene out of the park. Eilis Lacey is the most charming character to ever grace the silver screen. She had returned home to say goodbye to her sister, her mother was laying guilt trips left and right; can she be blamed for considering an option that would have allowed her to remain and take care of her mother. Temptation is always one stranger away who conforms to our vision of a perfect mate...none of us can easily sweep it aside. Yes the decision was imposed but that does not mean that she might have made that decision anyway. Ronan and the playwright both felt she would have returned to New York..."this was the life she had created on her own." Saiorse Ronan's performance was stellar. She is a simple girl with extraordinary talent. Watching the movie many times, I fell in love with a girl that didn't exist...only later I realized it was because she so reminded me of a girl I once had.